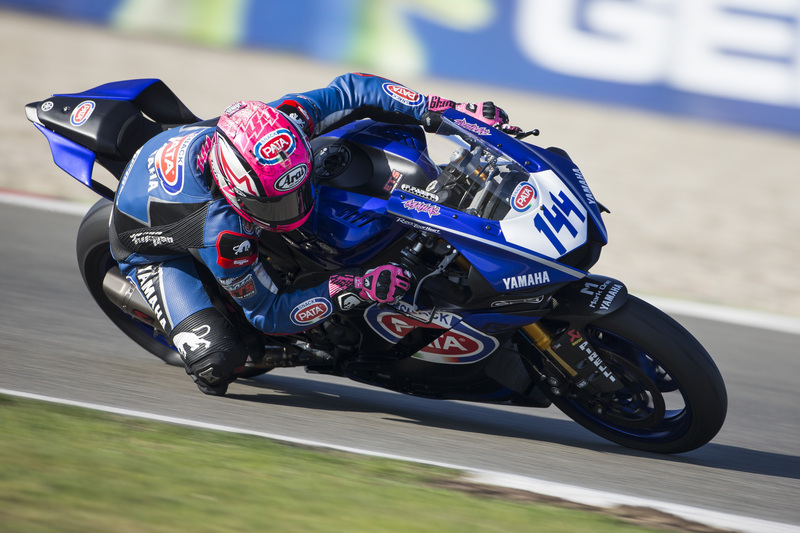 The GRT Yamaha Official WorldSSP Team fought back strongly on Saturday after a tricky opening day at Round 4 of the 2018 FIM Supersport World Championship in Assen. Championship leader, Lucas Mahias, managed to put his setup woes from Friday behind him to qualify second on the grid for Sunday’s race and maintain his 100% front-row start record in 2018. Federico Caricasulo also did not enjoy the best Friday at the TT Circuit Assen but, like his teammate, made a step on Saturday and qualified in seventh. European Supersport Cup rider Alfonso Coppola continued to make good progress on Saturday, showing constant improvement to qualify in 22nd. Mahias bounced back in style from a tough Friday at Assen to drop into the 1:38’s for the first time during the weekend in Saturday morning’s FP3 session with a 1:38.786. The 29-year-old French rider continued to work hard on his bike’s setup with his team during SP2 and a change halfway through the session certainly seemed to pay dividends. He went out for his final run in the 15-minute session and managed to set a stunning 1:38.085 – 0.286s off pole – on his penultimate lap to shoot up the timing screens and secure a front-row start, meaning he has been ever-present on the front row in 2018. Buoyed by his pace on Saturday, Mahias will continue to work hard with his team overnight and in Sunday morning’s Warm Up to ensure the reigning WorldSSP Champion has the best feeling possible with his Yamaha R6 when the lights go out for Sunday’s race. Caricasulo ended Friday’s practice in sixth overall and 0.998s off the pace but managed to improve his time in FP3 on Saturday morning to finish the session just 0.501s off the top rider with a 1:38.818. In SP2, he improved again but did not find the perfect setup for his Yamaha R6 and despite finding another three tenths to set a 1:38.569, he is slightly disappointed to be lining up for Sunday’s race in seventh on the grid. The 22-year-old Italian is fourth in the overall championship standings, just nine points behind his teammate, and will work overnight on the data collected on Saturday with his team to try and find the pace he needs to fight for the victory on race day in Assen. Coppola once again made good progress on Saturday. The 20-year-old Italian has improved in every session and, after ending Friday in 25th overall with 1:41.464, he improved significantly in FP3 to set a 1:40.859 which saw him end the session in 22nd. He managed to take over three-tenths off his best time in SP1 to set a 1:40.507, which saw him finish in 22nd, but a three-place grid penalty for riding slowly in the racing line in FP3 means the 20-year-old Italian will line up for Sunday’s race in 25th on the grid. The GRT Yamaha Official WorldSSP Team are ready to come out fighting on Sunday in Assen, with the action kicking off at 9:10 am CEST for Warm Up and the 18-lap race due to start at 11:30 am. Check out the full WorldSSP qualifying results.